Despite its small-town feel, Boulder is home to numerous wine bars, brewpubs, and other drinking establishments. You might enjoy sampling the following. Mountain Sun (and its South Boulder sibling, Southern Sun) is a casual, no-credit-cards-accepted brewpub. Its locally brewed beers have won a slew of medals, including multiple golds at the Great American Beer Festival. Mountain Sun is often packed — the burgers, burritos, and other affordable menu items draw crowds for dinner. Other local breweries include Avery (5763 Arapahoe), Twisted Pine (3201 Walnut), and Boulder Beer Company (2880 Wilderness Place). Oskar Blues in neighboring Lyons (303 Main Street, Lyons) is worth the 25-minute ride as well. Rooftop bars abound in Boulder. The West End Tavern's roof is covered on the street-side and open on the mountain-side; rain or shine, you'll be comfortable. However, you might have to elbow your way for a spot at the crowded bar. Other rooftop bars in town include the famous-for-its-margaritas Rio (1101 Walnut Street) and the spacious Lazy Dog roof (1346 Pearl Street). Bacaro (921 Pearl Street), across from the West End, sports an exposed second-floor patio that often hops with dance music at night. For happy hour specials in Boulder, a great bet is the Boulder Cafe. Located at the intersection of the Pearl Street Mall and 13th Street, the Boulder Cafe offers a large selection of half-price seafood specials. Oysters on the half-shell are particular favorites, along with shrimp by the partial pound. In warm weather, come early for a seat on the mall and watch the foot traffic and performers as the sun goes down. Other happy hour favorites include the LatAm-themed Aji (1601 Pearl), classy Brasserie 1010 (1011 Walnut), the diverse-menued Med (1002 Walnut), and the Rio (1101 Walnut). If specialty cocktails are your game, definitely stop by the Bitter Bar. Once a tiny corner of the Happy Noodle restaurant, the Bitter Bar ended up expanding to take over the entire space. Drinks aren't cheap — so take advantage of happy hour if you can. If you let your bartender choose, you'll likely be introduced to tastes here you haven't experienced elsewhere. Other elegant cocktail spots are the T-Zero Lounge at the St Julien Hotel (900 Walnut Street) and Q's at the Boulderado (2115 13th Street). 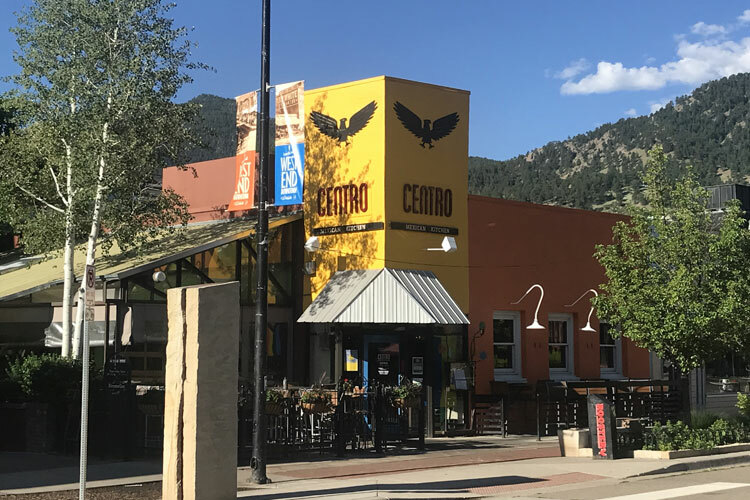 The patio at Centro is one of Boulder's summer hotspots. Locals and visitors alike flock to the open-air bar, made famous for its mint mojitos. A recent renovation of the interior has given Centro a warm and comfortable feel. Rub elbows at the bar or grab an outdoor table and watch the Pearl Street traffic flow by. A fun (if sometimes loud) time. Just off of Pearl Street, Conor O'Neils brings down-home Irish warmth to Boulder. This old world pub is a cozy place to sample drafts and listen to music. Monday night team trivia is a local favorite. When you get ready to wander, a few blocks north on 13th street are the Boulderado-sited Corner Bar with outdoor tables (2115 13th Street) and the delightfully dive-y Catacombs (2115 13th Street, basement).